Hi messabee, My apologies for the delay! The Nether and End should be accessible once again, and the underlying issue has now been resolved. Hi messabee, I think I've managed to reconnect the two ends of the inter-dimensional wormhole for that portal, go ahead and give it a try now! The results are in! July's top voters are... In 1st place, Pasqualio 30 coins & 1000 tokens In 2nd place, Grow 20 coins & 500 tokens In 3rd place, mpclass3 10 coins & 250 tokens Tied for 4th place, C_rex101 100 tokens Tied for 4th place, Hippie_Man_Stan 100 tokens Tied for 4th place, Seansbar 100 tokens And, in this month's double-feature, August's top voters were... In 1st place, MlSS_panda 30 coins & 1000 tokens In 2nd place, EkhoSonix 20 coins & 500 tokens In 3rd place, Seansbar 10 coins & 250 tokens Tied for 4th place, NeutronJohn 100 tokens Tied for 4th place, Captainspears 100 tokens Congratulations, and thanks to everyone who supported PickAxis by voting! Who will be next month's top voters? I think this idea was thrown around a few times among staff as well in the past. It's definitely a theme we'd like to do at some point! The results are in! January's top voters are... In 1st place, minemanZZ 30 coins & 1000 tokens In 2nd place, JakersCat 20 coins & 600 tokens In 3rd place, TheLavaMob123 10 coins & 400 tokens In 4th place, code_bomb 400 tokens In 5th place, Seansbar 200 tokens In 6th place, _SammyBaer 200 tokens And, in this month's double-feature, December's top voters were... In 1st place, JakersCat 30 coins & 1000 tokens In 2nd place, JSJ 20 coins & 600 tokens In 3rd place, Seansbar 10 coins & 400 tokens In 4th place, mpclass3 200 tokens In 5th place, Captainspears 200 tokens In 6th place, Enuamatali 200 tokens Congratulations, and thanks to everyone who supported PickAxis by voting! Who will be next month's top voters? I agree that the time required to grind experience for those skills is rather high right now. Originally, the plan was to have those levels as more of a leaderboard than anything--skills weren't even in the plans when the experience curves were set. I think one option is to move the skills down to a lower level with minimal (if any) modifications to the experience curve. That way, you'll gain something useful earlier on, but can continue to increase its benefits with extended use. Additionally, that maintains the leaderboard-style rankings that are already in place. Sorry for the delay, world resets are now done for this month. Happy holidays from Husker, Nick, and the rest of the PickAxis team! We hope you're having an awesome holiday season with your families and friends!  Log in between now and January 2nd to receive a holiday gift from PickAxis (to be awarded on January 3rd). Also, from now until January 4th, take 15% off all coin purchases with coupon code HOLIDAY16. And finally, we've updated all servers to version 1.11.2, the Exploration Update! See you in-game, explorers! Thanks to all of our active staff and players for their immense help throughout 2016. We're grateful to have some really awesome community members! Happy Holidays!